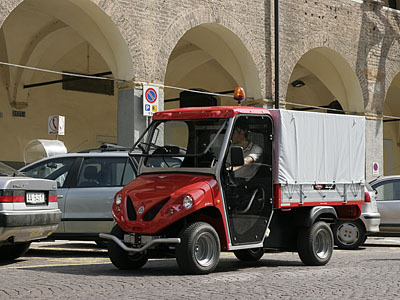 The Alkè electric vehicles easily resolve the typical mobility and utility needs local councils tend to have. Strong and reliable, they have multiple uses. 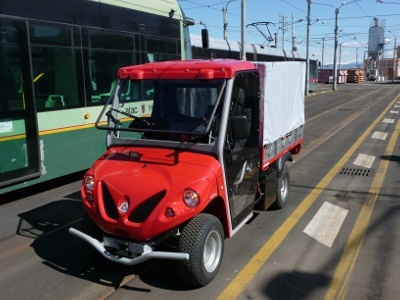 These are very small electric utility vehicles, in fact they’re only 127 cm. Large. This allows ATX Alkè vehicles to pass in even the narrowest of streets, to do maintenance on bicycle paths and anywhere normal cars can’t pass. There are contexts in which an electric van is a necessity and not an option. In town centers, the delivery of packages and letters is done mainly with bicycles or electric bikes, where even scooters are beginning to get frowned upon because of pollution problems. In cities the mentality is changing. The huge pollution problems are making the need to use zero emission vehicles a priority, for both people and goods transportation. Petrol or diesel trucks for postal deliveries can’t circulate in the town center limited traffic zones. So how to resolve the problem? 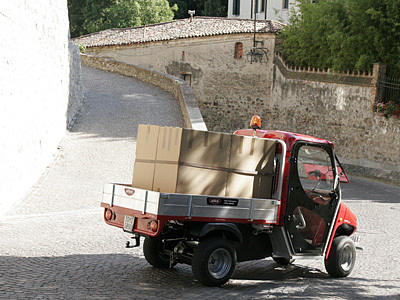 So there is a need for a road homologated electric truck to transport mail from the sorting office to the town center that must be able to carry a great weight but also pass through the narrowest streets in historic centers or climb the steepest roads to hill or mountain towns. If there are hard job conditions, then this is the Alkè electric vehicles job. 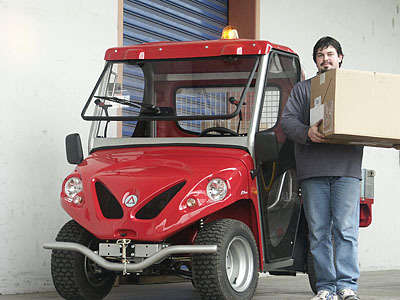 With their 8Kw (with peak power of 14,5Kw) separate excitation electric engines, the UTV are able to carry mail and packages for up to a weight of 600Kg with pendencies up to 35%. 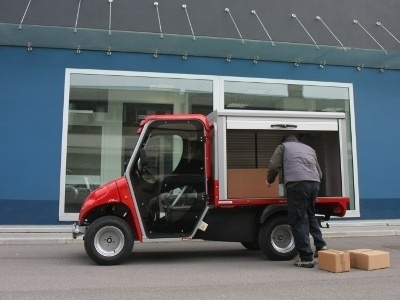 The Alkè electric trucks are used for urban package transport and are suitable for professional use. They are also useful for circulating inside mail warehouses or in structures where maneuvers are complicated and generally in any closed space without the worry of polluting fumes or noise pollution.